You now qualify for $45.00 OFF on your order! Your discount is applied for this product. Custom black & white 58” arc vented golf umbrellas don’t require a very tasty introduction because they have been around for long and still kicking around. Investing in personalized black &white 58” arc vented golf umbrellas is considered an act of smart marketing because customers never grow tired of black and white combination. 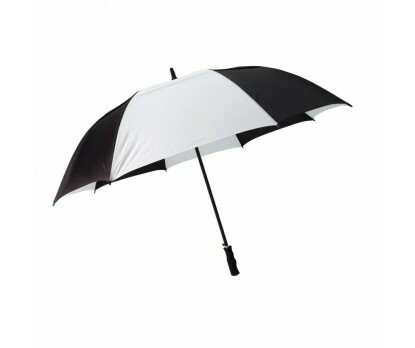 This umbrella can be sought for brand building in all seasons (specially rainy season, when golf tournaments are in progress) , as it can withstand wind gusts up to 50mph with ease. This smart promotional black & white 58” arc vented custom printed umbrella can be sought for brand building by all types of marketers because white and black are universal colors. Features – auto open function, extra strong fiberglass ribs and shafts, windproof duraflex construction, vented, rubber spray pistol grip handle, and black and white nylon sleeves. Dimensions - 36 1/4" L x 2" W x 2" H.
Imprint area - 10" W x 7" H.
Available Colors : Black, Navy,Gray, Black/White, Hunter/White, Red/White, Royal/White and Navy/White.